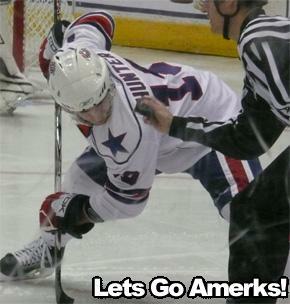 Featured Player: Dylan Hunter · Let's Go Amerks! Dylan Hunter has great positional instinct and is great when it comes to using his strength to dig in the opponentâ€™s corner.Â He isnâ€™t afraid to work hard and give his all when competing. In 2005, The London Knights started their season off with 31 wins in a row that year.Â Dylan helped propel the team to the OHL Championship and later the team won the Memorial Cup which is the highest honor for a junior team.Â Along with David Bolland and Rob Schremp, Hunter was a part of one of the best lines in the Canadian Hockey League. Dylan was drafted in the 9th round (273rd overall) in the 2004 NHL Entry Draft by the Buffalo Sabres. Hunter made his professional hockey debut in Rochester on October 6, 2006.Â In his first season with the Amerks, he tallied 8 goals and 20 assists in 67 games. This season, Dylan has played in 29 games and has 7 goals and 10 assists so far.Â He is seeing more responsibility and ice time and is delivering better play because of it. LetsGoAmerks: How old were you when you started playing hockey? DH: My dad (Dale Hunter of the Washington Capitals). LGA: Do you have any siblings? DH: Yes, one brother and one sister. LGA: What is your favorite hockey moment? LGA: When you have free time what do you like to do? DH: Play video games with the boys. LGA: Who is your favorite roommate?Â Why? DH: Stefan Meyer.Â He always keeps me laughing. LGA: What do you do during the off season? DH: Play golf and work out. LGA: What is your favorite movie? Why? DH: Goodwill Hunting.Â Why Not? Anything else youâ€™d like to know about Dylan Hunter?Â Please leave a comment and let us know.